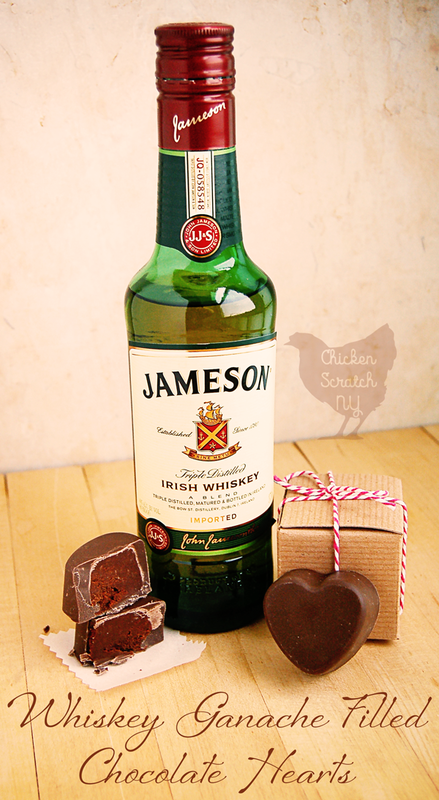 Nothing says Valentine’s Day like hearts, chocolate and booze. At least that’s true when you aren’t pregnant, but I am, so I didn’t even get to try these lovelies. I can say a very willing group of victims co-workers found them delightful, though to be fair I stacked the deck. My first choice wouldn’t have been Jameson Whiskey but sometimes you gotta play to your audience. 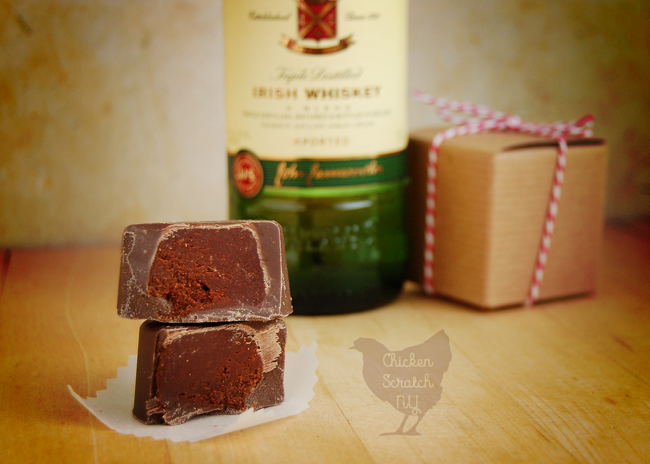 I will say it has a strong enough flavor to come through even though there is only the equivalent of one shot in the whole batch of Whiskey Ganache Filled Chocolate Hearts. You won’t get drunk on them but the whiskey definitely makes itself known. 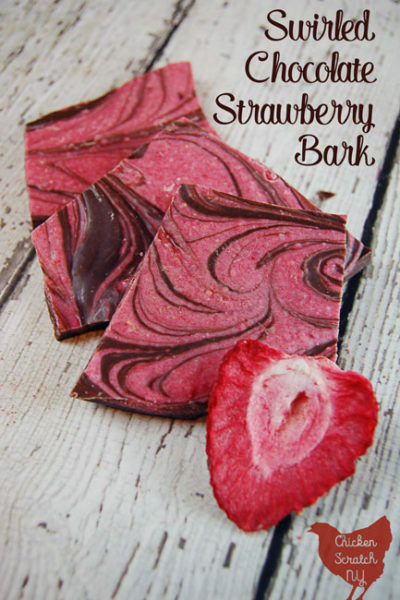 I decided to use chocolate flavored almond bark for the shell of these candies for a few reasons. One, it’s cheap. Two, it’s not gonna get that white bloom that non-tempered chocolate gets so they’ll stay pretty without requiring any skill. would give you good results too. These chocolates are a good size when they’re done, everyone who tried on commented on how solid they were. You won’t need more than one or two per person. that I picked up at Michael’s with a coupon and this recipe fills the mold almost perfectly. You might have a little bit of almond bark left that your husband may or many not scrape into your toddlers mouth when you aren’t looking. If you find my written description of the filling method odd and hard to follow watch this video: Nutella Filled Milk Chocolates it’s the one I watched to figure out the easiest way to do this in a silicone mold. I fancied them up by sticking them into some of the 2x2x2 paper boxes I still have left from the wedding favors. I put a piece of parchment between them on the off chance that they started to melt together (they didn’t). And of course a few loops of Baker’s Twine. Because nothing is complete until you add some striped twine! 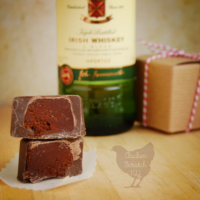 Win over the hearts of your friends and family with this recipe for Whiskey Ganache Filled Chocolate Hearts, no one has to know how easy it is! Oh wow these sound delicious and dangerous. As a non drinker I am sure it would take only one to have me dancing on tables. I must try them one day. Oh I really want to taste these. Chocolate with alcohol sounds like fun and would make a great treat for the adults. Would be great to take to a ladies night out. These look and sound delicious! I know quite a few people who would love these! Those truffles look like you purchased them at a candy shop. YOu did an amazing job with these. My aunt LOVES whiskey. I should make these and surprise her with them. Looks so yummy! Those sound perfect for Valentine’s Day. I’m not a huge drinker, but in chocolate, that I can do. I just bought some local Chattanooga Whiskey to use in recipes. I use a lot more liquor in cooking than I do drinking. This I might have to try. This looks so good! I bet these would make great valentines chocolates. Pinned!